Finland’s Mors Principium Est are still one of the best kept secrets in melodic death metal. Releasing quality material since their debut back in 2003, they are ready to unveil their seventh release Embers Of A Dying World. Along with acts like Kalmah, Skyfire and the disbanded Norther, they are writing material in the original essence of the melodic death metal movement. The melody comes from guitarist Andy Gillion while vocalist Ville Viljanen provides destructive aggressive vocals as an accompaniment. Despite going through a crucial lineup change when guitarists Jarkko Kokko exited the band and was replaced by current guitarist Andy Gillion, who handles the songwriting duties, their sound hasn’t changed dramatically since their debut. After a brief instrumental, Embers Of A Dying World kicks off in dramatic fashion with the orchestral “Reclaim The Sun.” The music is grandiose and ambitious while the orchestration adds a perfect dimension to the depth of the songwriting. Gillion’s riffs are as sharp as ever with the middle breakdown a driving freight train that is crushing. Gillon continues to utilize tremolo picking on the intro of “Masquerade” before another slamming riff explodes into the chorus. “The Colours Of The Cosmos” and “In Torment” turn up the aggression and pummel the listener. Closer “Apprentice Of Death” ends the album on a high note with another head smasher that heavily incorporates orchestration again. Halfway through a dynamic riff begins with a brilliant use of pull offs and hammer on’s as it is one of the most destructive on the record. Drummer Mikko Sipola shows off his double bass skills throughout the track. There isn’t a lot of diversity here and the material can sometimes run together and become monotonous. A nice exception is “Death Is The Beginning” which adds a gothic flavor as the tempo is slowed down considerably. Female vocals duet with Viljanen as he shows off a wonderful depth to his vocals as his guttural vocals here are some of his best. Gillon has mastered the effect of melodic guitar passages playing behind his aggressive riffs. Their use of orchestration as a backdrop to the music is a nice touch and helps separate their style from their contemporaries. The orchestration never takes away from the music and is flawlessly utilized as an added flavor. 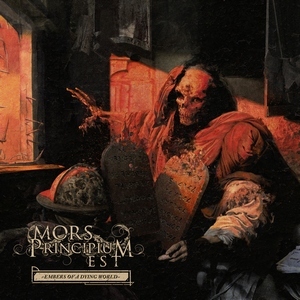 Embers Of A Dying World is another fantastic effort by Mors Principium Est. Andy Gillon continues to prove himself as an excellent songwriter as his guitar playing and songwriting is top notch in the genre. They continue to draw from their roots and may have released their finest effort yet.